After seeing DugOut Theatre Company’s ‘The Sunset Five’ at last year's Edinburgh Fringe, ‘Swansong’ was a must see for me and they certainly lived up to my expectations. 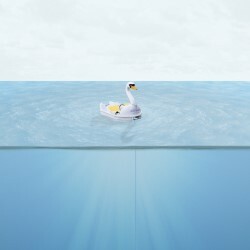 Swansong tells the hilarious story of four individuals, all of whom have totally different personalities and totally different outlooks on life, that are all stranded on a swan pedalo after the Earth has been completely flooded and the entirety of the human race has been wiped out apart from themselves. The silliness of the plot and the characters is what makes this performance so special. All of the actors are extremely talented and there are definitely no weak links in this performance. The story of the remaining four humans begins shortly before we learn that the last of the protein bars they have been living on have run out. Although the characters all fall into four massive personality stereotypes, something that might be branded cliche by some, are a perfect fit for this off-the-wall show. The fact that they are so cliche kind of adds to the comedy aspect perfectly. Firstly we have Adam the presumable (former) businessman who is the clever and logical one. Secondly we have Claire, the over exuberant, competitive gym nut who is keen to make the best of a bad situation. Next you have the yoga loving, vegan Buddhist Bobby who spends her time meditating in order to retain her sanity, and finally is the posh university student Stephen (think Jack Whitehall’s character JP in E4’s Fresh Meat) who just really misses meat, his friends and his dog. We see the characters argue before killing and devouring a swan they come across as they continuously paddle and drift around on their pedalo. They also use Bobby’s diary to take turns to note down the things that they miss about their old life and the bad things about the world pre-flood, in the hope that future generations may find it one day. While the show is about the end of the world, it is also about hope, which is important as it leaves you rooting for the characters and their survival so that they can continue to live and restart the human race. The performance is complete is fantastic one liners and fun quirky musical moments that will leave you in fits of laughter and wanting to come back and see it again!